Can I only collect North Coast-branded apple sauce pouches? No, your shipment can be any size. Your shipment may also be any size to earn the TerraCycle point donation for this program. After you have joined a TerraCycle Recycling Program, you may print a free, pre-paid shipping label by going to Profile on the top right side of the website. Then click “Send Us Your Waste.” The list of free recycling programs that you are currently registered for will appear. Then select “Get Shipping Label” under the appropriate program. Please note that you will need to be logged into your TerraCycle account to print shipping labels. Each piece of waste your location sends in will earn you about 2.6 TerraCycle points. 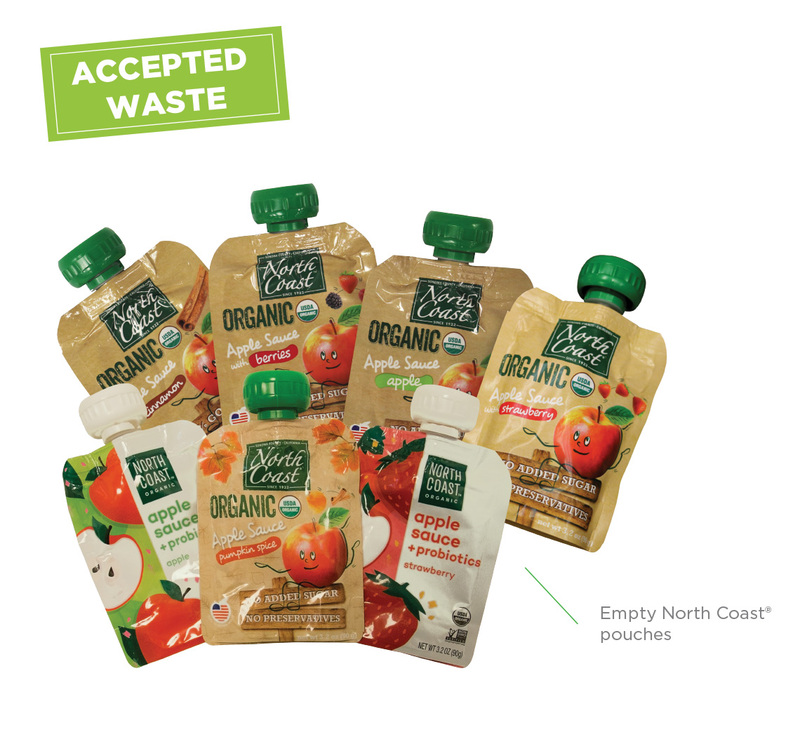 North Coast apple sauce pouches will be counted based on an average unit weight of 0.026 lbs. To recycle your waste, all you have to do is join at least one free recycling program and start collecting the waste stream indicated on the program's page. This is when you can get your friends and family involved! The more people collecting with you the more waste you will divert from landfill. TerraCycle's free recycling programs are open to all U.S. States EXCEPT for Alaska and Hawaii. If you live in Alaska or Hawaii, your account will be automatically deactivated and your location will not be able to print or request labels. We apologize for the inconvenience and hope to have free recycling programs running in those states and territories in the future.